Very topical political thriller, given the ongoing deportations of individuals from many countries by the US, including some who have spent their entire lives in the US. Chillingly believable. Not great fiction, but very engaging to listen to and read. Anthony Lee does excellent renditions of the characters with very divergent voices and personalities. Highly recommend the audible version! The writing style is a little different but in its slower pace well fits the ethnic group it portrays always methodical and pondering. The narration could have seemed also a little too monotonic but again I found it fitting to well represent the characters. The ending was not my favorite part. It is hard to believe that a teenager could be turned into a hate and killing machine in such brief time. But maybe that is what I would like to think. A book that will let you reflect on how quickly our real world can change. I really enjoyed the book. It is a powerful reminder of what could happen to us—as Americans—when we let our fears get the best of us. It’s scary to imagine an assembly center in this day and age at the Rose Bowl in Pasadena. Or just the idea that you can even lock up an entire group of people for no other crime than being the “wrong” race or ethnicity. In the book, we follow Henry Chin, who was an ex-military guy turned pharmacist. He’s been trying to live low and raise a hapa daughter after a war traumatic war experience in Panama. However, when they start rounding up Chinese Americans, he refuses to comply. He takes his daughter and together they make a run for Canada through the Angeles Crest mountains—with the help of Henry’s army buddy. Please note that I received this title for free in exchange for an unbiased review . Couldn't quite get in and connect with this one. I really wanted to. The plot and characters were interesting but I can't quite pick out where the disconnect came in. The only thing that I would like to change in this book is the narration mood. The story deals with a very serious and strong issue, but the narrator failed to bring weight to it with his voice. The entire book felt like he was just reading it line by line and didn't really convey any of the emotions. Gravity of the situation, pangs of the characters weren't communicated to the listener in an effective way. I didn't "connect" with the story, even though I feel strongly about this topic. If the narration was a tad better, I would've absolutely loved this book. This book is a riveting story, a tale of human endurance in the face of injustice. The Chinese Americans being subjected to force repatriation to China. It is fiction but could easily come true in some form, it has happened in the past (Russian pograms against Russian Jews) (most of us have seen "Fiddler on the Roof"). A strong set of characters within an excellent plot. I received a free copy of this audio book at my request, and I leave this honest review. okay this book is perfect!!! I just don't know how to describe the fact that I couldn't stop the book The fliehr the anxiety that book gave me was undescribable! 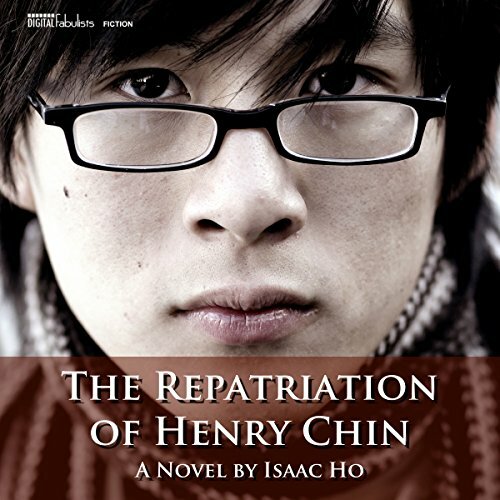 THE REPATRIATION OF HENRY CHIN is terrifying in its possibility, especially with someone like Donald Trump in the Whitehouse. Plus, America has already forced one ethnic group into internment camps in the past. Don't think so? All a person needs to do is look back in American history to WWII when all Japanese Americans, despite where and when they were born, endured "...forced relocation and incarceration in camps in the western interior of the country of between 110,000 and 120,000 people of Japanese ancestry, most of whom lived on the Pacific coast. 62 percent of the internees were United States citizens. These actions were ordered by President Franklin D. Roosevelt shortly after Japan's attack on Pearl Harbor...Those who were as little as 1/16 Japanese and orphaned infants with "one drop of Japanese blood" were placed in internment camps." So, if it has happened once, with a President who was much less volatile and elitist than the current President, why couldn't it happen again? I don't think it will take long for the current American racial tinderbox to explode. What that will look like? We have no idea, but Isaac Ho has obviously thought the issue through. With The United States and China on the brink of war, racial divides in America begin to focus on an "Us vs. Them" mentality. On one side of that divide is anyone with even a single drop of Chinese blood and on the other side is the rest of the American citizens. The President decides to place all Chinese people into camps "to keep them safe."